Morgan Stanley: "The Selling Has Just Begun; This Correction Will Be The Biggest Since February"
At the same time as Morgan Stanley's institutional traders were warning that the current tech sell is "different this time", warning that "you can’t have a >$100bn loss in a well held name and not have collateral damage" and calculating that "the performance of HF longs based on 13F holdings shows the last few weeks have been a ~2 standard deviation loss event", Morgan Stanley's chief US equity strategist, Mike Wilson, had some even harsher words: "the selling has just begun and this correction will be biggest since the one we experienced in February." The reason for that is the same one Nomura discussed on Friday: "the most important trade of the past decade is now reversing" namely the reversal of the growth/value which has also commingled with the "momentum trade", abd which means that the growth/tech "market leadership" that defined the market for the past decade is now gone at least for the time being. The reason for that is simple: after the stock prices of tech stocks got carried away in the first half, their Q2 earnings, even though for the most part significant beats to expectations, left the market asking for more, leading to such historic blow-ups as Facebook and Twitter, in the process crippling the momentum trade and forcing numerous unwinds. Friday finally showed signs of market exhaustion. With Amazon's strong quarter out of the way and a very strong 2Q GDP number, investors were finally faced with the question of "what do I look forward to now?" 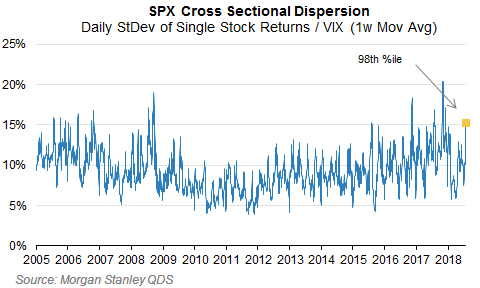 As a reminder, Morgan Stanley was the one bank which on July 8 "went out on a limb" downgrading tech stocks to Sell and as Wilson comically adds, "truth be told, we haven't had much interest from clients wanting to follow us down this path." 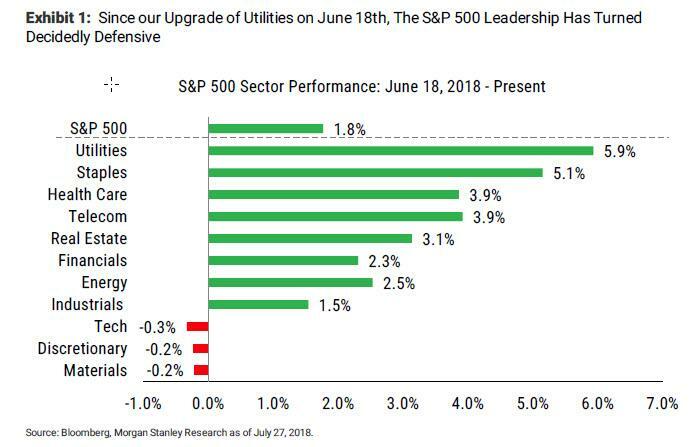 Nevertheless, he adds somewhat gleefully, "since our upgrade of Utilities on June 18th, defensive sectors have meaningfully outperformed." Below is the chart that Wilson would like to call his "victory lap." 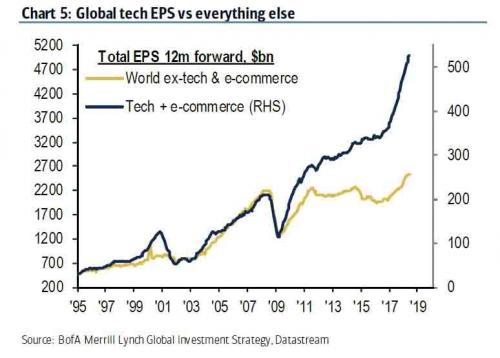 While our call did not foretell of any major earnings misses, it did suggest there was a lot more risk in Tech and growth stocks generally than what was perceived. Therefore, even good earnings could lead to disappointing price action while any miss would be severely punished. From our vantage point, the weaker earnings beat from several Tech leaders and outright misses from Netflix and Facebook were simply additional support for our call. Here Morgan Stanley also invokes the "dumb herd" concept touched on earlier by Citi, with Wilson writing that he admits "the market sent some misleading signals over the last few weeks by limiting the damage to the broad indices when Netflix and Facebook missed." We believe this simply led to an even greater false sense of security in the market. The icing on the cake was perhaps the positive statements following the talks between Juncker and Trump which pushed the major indices past key resistance levels late in Wednesday's session. The price action in that last half hour of trading Wednesday showed some evidence of potential "panic buying" and hedges getting stopped out. Wilson, moonlighting as a comedian, then adds that Morgan Stanley itself "was having a difficult time ourselves as the S&P passed our upside target of 2830." However, everything changed just 2 days later, and by Friday, the market finally exhausted. With Amazon's strong quarter out of the way, and a very strong 2Q GDP number on the tape, investors were finally faced with the proverbial question of "what do I have to look forward to now?" The selling started slowly, built steadily, and left the biggest winners of the year down the most. The bottom line for Wilson and Morgan Stanley is that "the selling has just begun and this correction will be biggest since the one we experienced in February." But the far worse news is that a liquidation in tech/growth "could very well have a greater negative impact on the average portfolio if it's centered on Tech, Consumer Discretionary and small caps, as we expect." 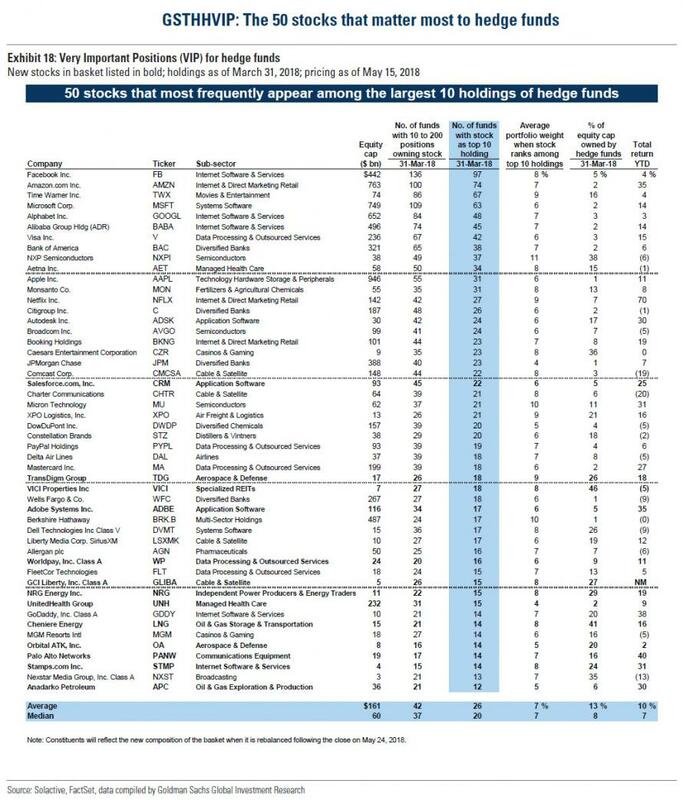 He's right: as a reminder, the vast majority of the stocks most widely held by the hedge fund community are tech names. 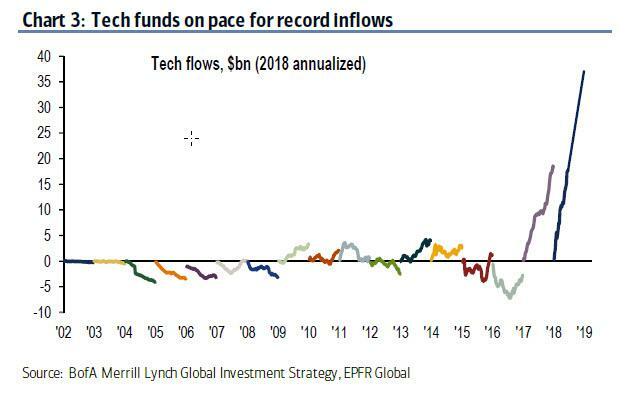 There is a silver lining: while tech's decade-long leadership may be ending, it may provide some relief for long-suffering value investors, who have been crushed as growth has consistently outperformed value for years on end. 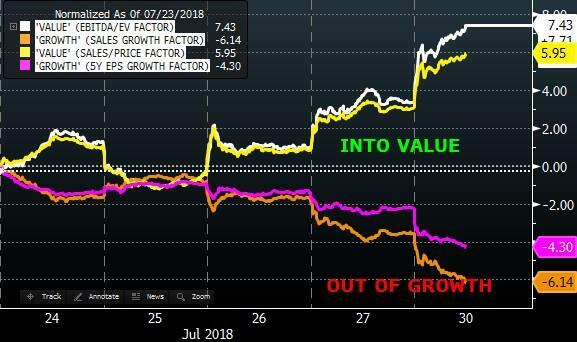 However, a reversal is starting as we wrote in "Entire Equity Universe In Turmoil": Hedge Funds Crushed As Value/Growth Unwinds" and just on Monday, value stocks already outperformed growth stocks by 1.8%. It could just be the beginning of a long overdue mean reversion as the market's biggest hedge fund hotel ever burns down. If a mean-reversion is indeed on deck, the profits for value investors - at least those who are still alive - could be phenomenal, and would come at the expense of growth investors who could face a quick and brutal catastrophe, now that the world is shifting from a monetary-led stimulus, to a fiscal one, as JPM's Marko Kolanovic suggested earlier. There is one additional consideration: as Bloomberg notes, correlations between all investment factors are once again on the rise, citing a Bernstein report, which is increasing systematic risk for active investors, and these "linkages may only continue to tighten as the earnings season concludes, as investors pay more attention to global threats." This threatens another group of investors: as Bloomberg explains, not only have same-way factor moves crippled quantitative funds - which rely on the diversification benefit of multiple factors - "but rising correlations also make it difficult for fundamental managers to scrub out unwanted factor risk" according to Fraser Jenkins, who recommends reducing active risk. “With growth becoming less synchronized, correlation on the rise and value no longer representing cyclicality, this is all evidence that we are heading towards a phase when growth will start to slow,” Fraser Jenkins wrote. Assuming Morgan Stanley is correct, and the market is facing a sharp, painful drop, the biggest lingering question is just how far president Trump, who has made his displeasure with falling stocks clear on numerous occasions, go before launching another attack on the Fed and demanding an end to tightening, if not lower rates and, eventually, QE?